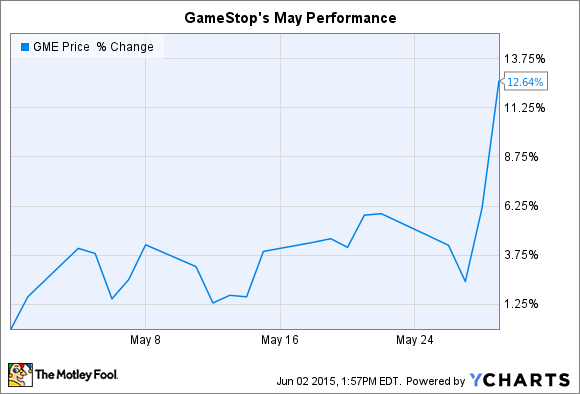 What: Video game retailer GameStop's (NYSE:GME) stock rose 13% in May, according to S&P Capital IQ data. Shares are up 21% in the last year and close to the 52-week high of $46 set last summer. So what: Last month's jump came after the retailer posted strong first-quarter earnings results. GameStop's comparable-store sales spiked by 9%, 3 percentage points higher than management had forecast. That growth came as management engineered an improvement in GameStop's already dominant market share position. The company created more distance from its rivals by accounting for a record-high 46% of all video game hardware and software sales last quarter. Now what: GameStop in late May issued a soft forecast for the current quarter, saying the industry will likely stay flat in comparison to last year. But that's only because 2014's second quarter was dominated by two massive blockbusters: Mario Kart 8 and Watch Dogs. No comparably huge hits are set for release this summer. Meanwhile, the company is making its boldest diversification move yet in opening 200 new stores within its technology brands segment this summer. That store count target is four times as many new locations as GameStop has ever attempted. But executives are excited by the sales and profit growth potential of the tech brands unit, which encompasses cell phone service under the Spring Mobile and Cricket brands and consumer electronics sales under the Simply Mac brand. Those businesses grew revenue by 70% in the first quarter while expanding profitability from 36% to 40%. At that pace, GameStop's business could quickly benefit from improved earning power and a lower reliance on video game sales.